Lithic reduction involves the use of a hard hammer percussor, such as a hammerstone, a soft hammer fabricator (made of wood, bone or antler), or a wood or antler punch to detach lithic flakes from a lump of tool stone called a lithic core (also known as the "objective piece"). As flakes are detached in sequence, the original mass of stone is reduced; hence the term for this process. 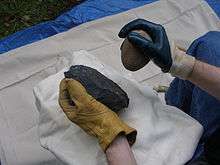 Lithic reduction may be performed in order to obtain sharp flakes, of which a variety of tools can be made, or to rough out a blank for later refinement into a projectile point, knife, or other object. Flakes of regular size that are at least twice as long as they are broad are called blades. Lithic tools produced this way may be bifacial (exhibiting flaking on both sides) or unifacial (exhibiting flaking on one side only). It has been shown that stages in the lithic reduction sequence may be misleading and that a better way to assess the data is by looking at it as a continuum. The assumptions that archaeologists sometimes make regarding the reduction sequence based on the placement of a flake into a stage can be unfounded. For example, a significant amount of cortex can be present on a flake taken off near the very end of the reduction sequence. Removed flakes exhibit features characteristic of conchoidal fracturing, including striking platforms, bulbs of force, and occasionally eraillures (small secondary flakes detached from the flake's bulb of force). Flakes are often quite sharp, with distal edges only a few molecules thick when they have a feather termination. These flakes can be used directly as tools or modified into other utilitarian implements, such as spokeshaves and scrapers. Projectile percussion is so basic as to not be considered a technique. It involves throwing the toolstone at a stationary anvil stone. This method provides virtually no control over how the toolstone will fragment, and therefore produces a great deal of shatter, and few flakes. It is difficult to be sure whether or not this method of lithic reduction was ever a commonplace practice, although noting sharp edges on a broken rock might have led early man to first recognize the value of lithic reduction. In most cases, the amount of pressure applied to the objective piece in soft-hammer percussion is not enough for the formation of a typical conchoidal fracture. Rather, soft-hammer flakes are most often produced by what is referred to as a bending fracture, so-called because the flake is quite literally bent or "peeled" from the objective piece. However, it should be noted that a bending fracture can be produced with a hard hammer. Flakes removed in this manner lack a bulb of percussion, and are distinguished instead by the presence of a small lip where the flake's striking platform has separated from the objective piece. A blank is a thick, shaped stone biface of suitable size and configuration for refining into a stone tool. Blanks are the beginning products of lithic reduction, and during prehistoric times were often created for trade or later refinement at another location. Blanks were often formed through the initial reduction of lumps of tool stone at simple quarries, often no more than easily accessible outcroppings of the local tool stone (although this was certainly not the case at Grimes Graves in England). Sometimes the shape of the blank hints at the shape of the final tool it will become, but this is not always the case. A blank may consist of either a large, unmodified flake or a reduced core, often with a rough subtriangular or lanceolate shape. 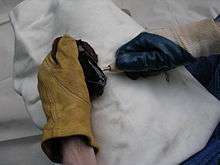 Rough chopping tools, derived by removing a few flakes along one edge of the cobble, can also be considered to fall into this group. A preform is the rough, incomplete and unused basic form of a stone tool. 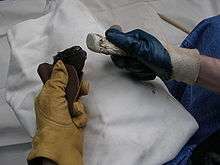 Typically, a preform is the shaped remnant of a lithic core. Larger and thicker than the intended tool, it lacks the final trimming and refinement that is present in the completed artifact. Sometimes basic features such as stems and notches have been initiated. In most cases, the term refers to an incomplete projectile point. ↑ Kuhn, Steve (1990). "A Geometric Index of Reduction for Unifacial Stone Tools". Journal of Archaeological Science. 17: 583–593. doi:10.1016/0305-4403(90)90038-7. ↑ Hiscock, Peter; Clarkson, Chris (2005). "Experimental evaluation of Kuhn's geometric index of reduction and the flat-flake problem". Journal of Archaeological Science. 32: 1015–1022. doi:10.1016/j.jas.2005.02.002. 1 2 Hiscock, Peter; Tabrett, Amy (2010). "Generalization, inference and the quantification of lithic reduction". World Archaeology. 42 (4): 545–561. doi:10.1080/00438243.2010.517669. ↑ Shott, M.J. (1996). "Stage versus continuum models in the debris assemblage from production of a fluted biface". Lithic Technology. 21 (1): 6–22. ↑ Pelcin, A. (1997). "The effect of indentor type on flake attributes: evidence from a controlled experiment". Journal of Archaeological Science. 24: 613–621. doi:10.1006/jasc.1996.0145. ↑ Pelcin, A. (1997). "The Formation of Flakes: The Role of Platform Thickness and Exterior Platform Angle in the Production of Flake Initiations and Terminations". Journal of Archaeological Science. 24: 1107–1113. doi:10.1006/jasc.1996.0190. ↑ "Stone Agers Sharpened Skills 55,000 Years Earlier Than Thought". Wired. 29 October 2010. ↑ Tamar Kahn (29 October 2010). "Scientists Find Earliest Evidence of Method of Shaping Weapons". AllAfrica.